Late last month, the USEPA published the long-awaited revisions to the Underground Storage Tank (UST) rules under 40 CFR 280 and 281. The full 120-page rule is available on the EPA Office of Underground Storage Tanks website (http://www.epa.gov/oust/fedlaws/revregs.html) and has just been published to the Federal Register. If you do not have the time to delve into the document, we have put together this summary of 10 key things you need to know about the 2015 rule rewrite. This is not an exhaustive list, and the full rule text should be consulted for a comprehensive understanding and evaluation of owner/operator obligations. OPERATOR TRAINING IS REQUIRED FOR EVERYONE – The Energy Policy Act of 2005 only required training for operators in states that received monies from the EPA. This change ensures that all operators across the country and in states without operator training requirements, and in Indian Country, have training. The EPA is attempting to ensure that all operators across the country are trained to prevent and respond to releases. The EPA has provided a 3 year timeframe for implementation. WALKTHROUGH INSPECTIONS ARE REQUIRED FOR ALL FACILITIES – Monthly (30) day inspections are required for all facilities that consist of a visual evaluation of spill prevention equipment and release detection equipment. Containment sumps such as for STPs, piping must be viewed at least annually. The purpose is to ensure that owners are looking regularly at their equipment to catch problems early and prevent releases. The EPA is allowing a 3 year adoption period for these inspections. TESTING REQUIREMENTS FOR SPILL PREVENTION EQUIPMENT, OVERFILL PROTECTION EQUIPMENT, CONTAINMENT SUMPS, AND RELEASE DETECTION – Owners/operators are required to test spill prevention equipment, containment sumps used as secondary containment for piping and overfill protection equipment every three years, and release detection devices must be tested annually. This testing will ensure that all components of a UST system that are designed to detect and prevent a discharge are operating properly. Some components, such as spill buckets, will fail. This rule modification will help operators catch issues early. The EPA is requiring testing within 3 years of the adoption of the rule. EMERGENCY GENERATORS ARE NO LONGER EXEMPT FROM PERFORMING RELEASE DETECTION MONITORING – With technology now available to monitor tanks and detect releases at remote locations, the EPA has lifted the deferral on this requirement. Owners/operators of emergency generator tanks are now required to equip tanks with release detection monitoring. The EPA is allowing 3 years for the upgrades to take place. FIELD CONSTRUCTED TANKS AND AIRPORT HYDRANT FUEL DISTRIBUTION SYSTEMS MUST PERFORM RELEASE DETECTION – The 1988 UST Regulations deferred release detection for hydrant systems and field constructed tanks because there was not sufficient technology or information available to effectively test these systems. With technology changes in the marketplace, methods are now available to monitor and detect releases at alternative leak rates and frequencies. To address the uniqueness of these systems, EPA has added in an entirely new subsection (Subpart K) that outlines the general requirements and exceptions. As for an adoption timeframe, various provisions are phased in anywhere from immediately to over a seven year period. VENT LINE FLOW RESTRICTORS ARE NO LONGER AN OPTION TO MEET OVERFILL REQUIREMENTS – UST systems used to be able to rely on flow restrictors on vent lines (ball floats) as a means to meet the overfill prevention requirements of the 1988 UST rule. Several inherent weaknesses had been identified with the use of this technology, which included in the over-pressurization of tanks. Owners/operators are required to use alternate overfill prevention measures listed in the rule (Subpart B) on all new systems and replaced vent lines. This portion of the rule goes into effect immediately. INTERNAL LINING NO LONGER ACCEPTABLE AS A SOLE MEANS OF CORROSION PROTECTION -In the past, UST systems that relied on an internal lining as the sole method of corrosion protection could add another internal lining, cathodic protection, or both when internal lining failed a periodic inspection and could not be repaired. The new rule requires tanks using internal lining as the only method of corrosion protection to be permanently closed if the internal lining fails inspection and cannot be repaired according to a code of practice. This portion of the rule is effective immediately. OWNER NOTIFICATION PRIOR TO SWITCHING TO REGULATED SUBSTANCE CONTAINING >10% ETHANOL, 20% BIODIESEL, OR THAT MEETS COMPATIBILITY CONCERN REQUIREMENTS – With the increased use of biofuels in the marketplace, there is an increasing concern regarding tank material compatibility. The rule revision addresses this concern by requiring owners/operators to notify the regulatory agency at least 30 days prior to switching to a regulated substance containing greater than 10 percent ethanol, greater than 20 percent biodiesel, or any other fuel that the agency identifies as a concern. The owner/operator must demonstrate material compatibility through a listing by a nationally recognized testing laboratory, equipment manufacturer approval, or other method that the agency deems to be no less protective. This change is effective immediately. INTERSTITIAL MONITORING RESULTS NOW REPORTABLE – As interstitial monitoring becomes a more widely used method of release detection, the EPA has clarified the rule to include its use. Specifically, interstitial alarms are now considered an unusual operating condition under release reporting. EPA adds an option to test secondary containment when present as a means of investigating and/or confirming a release. The rule also adds an option for system closure if a test confirms a leak. This portion of the rule revision is effective immediately. STATE PROGRAM APPROVAL REQUIREMENTS – States that receive monies from the EPA are required to address the changes made to 40 CFR 280 within 3 years of adoption. Specifically, states must meet the delivery prohibition, operator training, and groundwater protection requirements contained within the Energy Policy Act of 2005. As stated at the beginning of this article, this list is not a comprehensive or complete summary of the rule changes. There are other key provisions and clarifications that are contained in the rule text and preamble. Should you have any questions regarding your tank system and whether or not your facility is in compliance with the new rule, we suggest you contact our Eclipse Division for an evaluation and consultation. Joel Hershey is the Director of Environmental Compliance Services, Inc. (ECS’) Eclipse Fuel System Management Division. He has worked exclusively in the field of petroleum liquid storage systems since 1989. His expertise includes compliance testing, diagnostics, petroleum construction, maintenance, and upgrades for both UST and AST systems. During his career, Joel has held various positions, including Senior Petroleum Specialist, Operations Manager, and four years as Senior Vice President for Tanknology. There he managed and executed upgrades for more than 6,800 facilities to meet the 1998 federal UST systems upgrades. He can be reached at (800) 789-3530 or jhershey@ecsconsult.com. As always, feel free to contact us at 1.800.451.4021 with any questions. The Red Jacket Maxxum ‘Pigtail’ connector will transition to a new UL approved connector with a black grommet. This connector change will phase in over the summer. No other characteristics of this part are changing and either connector can be used with confidence on any 6” Maxxum/Big Flo/High Capacity job site. Please refer to Manual part nos. 577014-089 or D051-301 for full details concerning installation, operation and maintenance requirements. As part of our continued roll out of Maxxum improvements in 2014 and 2015, the following part number changes apply. Customer Service will work with you to provide uninterrupted access to parts as we complete the transition from the old to the new part numbers. 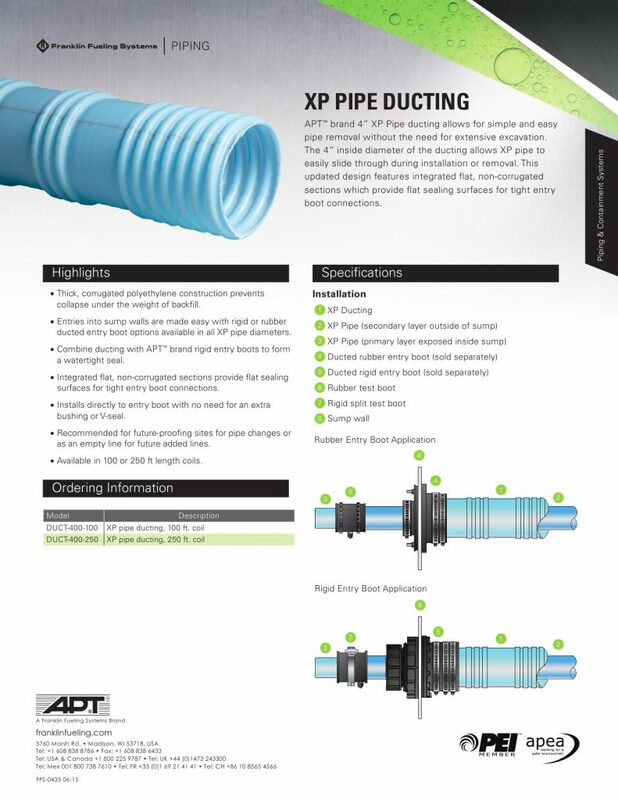 Franklin Fueling’s updated design to the 4″ APT brand XP ducting features integrated flat, non-corrugated sections providing flat sealing surfaces for tight entry boot connections. Click on the image below to read the full specs on this updated design.